The backpacks and walking sticks. Sometimes the best part of the day is when you can take them off and soak your feet. The morning starts with the sound of a zipper, then another, a Velcro rip, someone in flip-flops heading to the bathroom. Then more zips and rips, rustle of bedding. No voices yet, but soon the coffee and toast promote some whispers, and gradually these attempts to keep quiet are abandoned. Backpacks are quickly organized, boots are laced, straps adjusted, and the first few pilgrims set off down the road before the day is fully declared. This is the early morning rhythm of the Camino de Santiago, and these sounds are gentle alarms waking the weary to a new day of walking. In this albergue (shelter) there might be 40 pilgrims spread around large or small bunkrooms, men and women, young and old, representing scores of countries and languages. And still, as the day begins, most everyone feels a wonderful sense of solitude, if not privacy. What is the best route for the Camino de Santiago? How is it that this popular expedition across Spain still captures the individual with some of the hardships and rewards of a wilderness experience, even in the midst of a populated area? 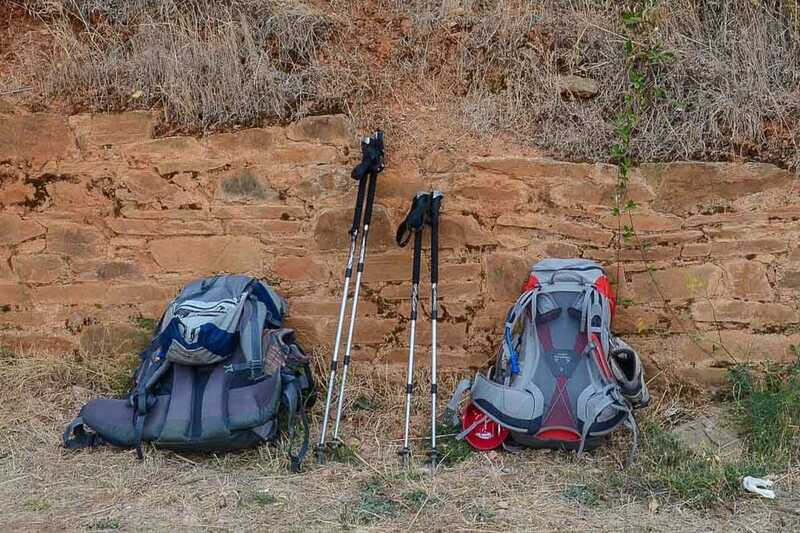 More people than ever set out on the Camino each year, most using the Camino Frances–the French Way–from St. Jean Pied de Port in the French Pyrenees to Santiago de Compostela in northwestern Spain. This 800-kilometer route (about 500 miles) typically takes about 32 days to walk (we slowed it down to 40 days), and is well marked and well developed with plenty of shelters and hostels. Because it’s so well organized, its attractive to solo travelers, even though one is rarely alone. There are many routes of the Camino de Santiago even within Spain and Portugal. You can start in Barcelona, Sevilla, Madrid, or Lisbon, or any point in between. Or you can take the more mountainous Northern Route that parallels the Camino Frances closer to the northern coast of Spain. Eventually you will merge into a well-known route–usually the Camino Frances–and end up in Santiago de Compostela. There are usually guidebooks available for all the various routes. No route is any better than another, except perhaps that the Camino Frances is a little more developed than most. The Christian motivation for the pilgrimage was–and still is, I suppose–a plenary indulgence, which is a big time pardon for sins. Today’s pilgrims wouldn’t complain about being wiped clean of prior sins, but cite other purposes: the experience, the history, exercise, time to reflect, renewal of spirit, even the opportunity to meet new people. It’s not supposed to be easy. Penitence is, consciously or unconsciously, part of the deal. 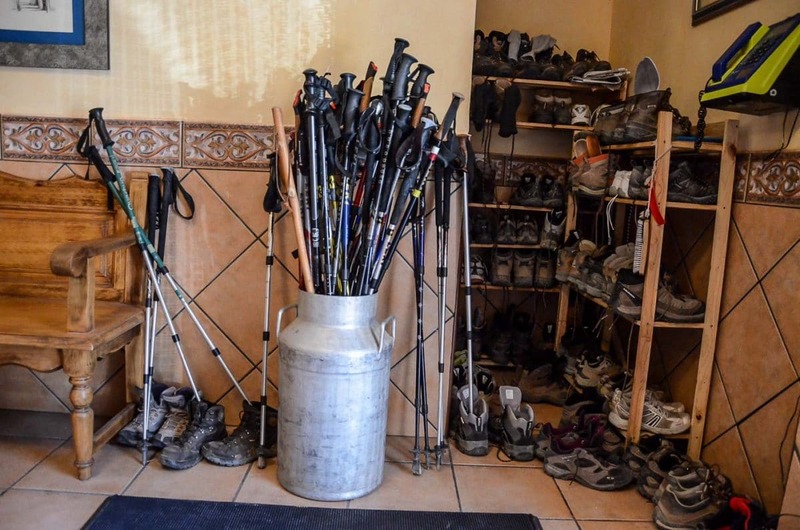 These days it’s easy to find mounds of information about the Camino de Santiago, mostly related to the logistics of the trek and less so on the experience of the journey. Guidebooks and articles advise walkers on where to stay, routes to consider, what to carry, how to pack. Every item is considered ahead of time: food, electronics, socks, the weight of a t-shirt, headlamps, first aid kits, and laundry soap. (We have several posts on just those topics, which you will see links for at the bottom of this story.) Some people (I wasn’t one of them) even train for the Big Event by walking around their local park with books or bricks in their backpacks. As the first day approaches, it becomes abundantly clear that a liter of water weighs, in fact, one kilo. That’s 2.2 pounds to us Americans. It is less apparent in advance what we will do with ourselves besides walking toward Santiago. Should I carry this book? Will I keep a journal? Do I dedicate this pilgrimage to a loved one or cause? Do I carry too many expectations? Too little sense of history? For most of us, being on the Camino de Santiago has little to do with the logistics and even less to do with the ancient pilgrimage. So let’s not talk about our feet, nor the snoring in the bunkrooms. Let’s talk about what it feels like to walk the Camino. Any lessons imparted here are purely coincidental. Boots crunch on gravel paths, walking sticks click along. It sounds simple, of course, because we’ve walked a little every day since we were little tykes. But this makes me wonder if putting one foot in front of the other is a thing of the past. On the Camino we walk for six hours a day, more or less, day after day, and the physical effects suddenly become part of every conversation. Blisters, backaches, and fatigue are commonplace. But hiking the Camino is not technically difficult. There is just a lot of walking. No matter your physical condition, endurance depends on making frequent adjustments. Re-lacing shoes, tipping the pelvis just so, using walking sticks or abandoning them for a while: these are all helpful alterations that ease the pain. The best advice I received probably saved me from injury: if you want to take a look around, stop first. One misstep can be the end of the Camino. The trail varies significantly through the course, though in the high plains the monotony is palpable. For many, the climbs or descents along uneven paths are the most troublesome. For others, entering a large city at the end of a long day’s hike is stressful and dispiriting. Unintended detours from the marked way will happen, but generally a local resident will point you in the right direction before you even think to ask. Essentially, the walking itself is a mantra, every few steps a breath, and each hour a meditation. Walking and the overwhelming repetition signify there is only this to manage right now, putting one foot in front of the other. Nothing else is required. And so comes the existential appreciation of the surroundings, the others, and even the self. Ironically, I think of the church’s fear that meditation’s emptying of the mind is dangerous, allowing the devil to enter in. But the drudgery of it is calming, a relief from daily pressures and an expansive sense of existentialism–just being on the Camino. Over the course of 40 days, conditions–and moods–can fluctuate quickly with changing elevation, weather, and terrain. But the beauty of the Camino is its slow procession. The environs slip by like a picture window passing gracefully along the periphery. The internal mantra now seems to emanate from the land around. Fence posts, grazing sheep, shapes of trees, and curving riverbeds slip in and out of focus. Bird songs, cowbells, a barking dog, and the persistent greeting, “Buen Camino,” punctuate the hike. Going by foot, the eyes and all the senses are wide open. Green hills, yellow meadows, blue skies; vast plains, distant mountains, rock piles artfully arranged by a previous pilgrim; hot sun, scant shade, high winds, a snow squall. We dodge cow dung in the little village, and cars and motorcycles in town. Sometimes the best we hope for is a broad brim to break the sun, dry socks, or another, smellier pilgrim to draw the flies away. All this fits into the viewfinder and remains when the day is done, even when the journey is long past. While I walk, I take very few pictures. Most of my photos are taken when I’ve pulled off the road and wandered into a cool dark church. The albergues will be filled every night with the sticks and boots, and snores, of your fellow pilgrims. Yes, we all walk alone, but then there are all those other people walking alone with you. The wild cards, I like to call them, just as unpredictable as the weather. Even though I’m with my husband, we rarely walk within talking range of each other. I want the quiet, I want to count the birds I see, observe the clouds, ponder the people who gave me the gift of loving the outdoors. I feel lonely, but thankful. It’s not that I don’t want to hear other people talk, it’s that I don’t want to have to respond. But there are all these fascinating people with all their stories to be found on the Camino, and I’m inevitably drawn to others. Such a cast of characters! We meet newlyweds and newly divorced, recently hooked up and recently frustrated. A couple people are accompanied by their dogs. One dreadlocked guy has rigged a cart stacked precariously with camping gear he drags behind him. Another fellow is looking for his former girlfriend, who was last seen with the cart guy. A few people have become semi-permanent pilgrims, living on the Camino in season. (And it’s an alluring concept, since once there, very little else is required.) We meet pilgrims from five continents. A man in his 80s has walked from someplace on the other side of the Alps. Another old-timer is making his annual trek across the highest peak of the Camino. A son with his mother, some students who thought it would look good on their college application, a couple northern Europeans who are practically running to complete the trip in 18 days. We keep track of each other as best we can. It doesn’t take long for particular personal stories to emerge. Generally, conversation starts with a story of intention, why we are here on the pilgrimage. Most are eager to point out it is not a religious experience, but a spiritual one–which I take to be a sign of the times and an opinion of the church. Conversation then turns from the sublime to the ridiculous. Books are a popular topic, as are sports and travel. Everything is fair game, from bad jokes to philosophy. Everyone seems to understand that just as easily as you might join in a conversation, you can slip away to walk alone. So the Camino can be both a solitary venture and one filled with camaraderie. And it can be competitive at times – for beds or for attention. Yes, human needs pop up here, too. The pilgrim’s passport is an admission ticket to the inexpensive albergues, which usually charge around 5 Euros per night. Walkers are given first priority; bikers are allowed on a space available basis. Recognized shelters might be operated by the city or county, by a monastery or parish, or, rarely, by a private party. In high season or toward the final stages of the Camino, the rush for beds can be an issue. (I could even sense a rush to be first out the door in the morning.) I was never turned away from a refuge, though a couple nights I was relegated to a mat on the floor, and in one town, there was a shuttle service carting overflow pilgrims to the next village. Part of the experience is observing the wildly different approaches to the Camino. Of course, not everyone has a month to devote to the walk, so they might take it in stages. And not everyone schleps a big pack. I appreciate that those who aren’t able to lug their belongings can have their bags shipped each day to the next destination, a service that allows many injured or aged to keep on going. But I’d be lying if I didn’t add there’s a fair amount of pride in walking it all with a pack, and some disdain for those who bail out and head to a nice hotel. All’s fair, just don’t drive up in a car and then try to get between me and my shower and cot. Every day we set out without knowing where our footsteps will take us. We don’t know much about the terrain, and we have only a vague idea of where we’ll land the next night. Usually, after an hour or so, we stop for a little coffee pick-me-up, a short break, and some readjustments according to today’s weather. For lunch we find a shady place to sit, and snack on fruit and bread with cheese or nuts. We might stop again to refill water or rest sore feet. Then the mind turns to the distance covered, and the distance still to go, and we are eager to lift our burdens back onto our shoulders, as if the packs themselves propel us on our way. We learn to estimate the distance to the next village, the faint group of buildings over there on the hill. I fall into a habit of counting things to mark the passing time and distance: trees, rocks, bikers who’ve passed us by. The final stretch of the day’s walk is inevitably uphill to the albergue set within the city walls next to the cathedral at the tippy top of the mountain. Up and up on steep, slippery cobblestones, every day, or so it seems. Once we’ve found our bed, there’s a luscious ritual, still more of the day’s rhythm. Shower (ahhh), wash clothes (yes), and hang them out to dry. Relax or nap with the feet gently propped up. Now for a little reading or writing. Or we head directly to the bar for a beer and some olives to last us until the dinner hour. A few familiar faces from the day gather into a circle. Laughter and relief are splashed around the table. Before dinner a handful of pilgrims find their way to church for a daily show, a little prayer, or simply to take a look and bask in the cool comfort. In these corners, we glimpse the long history of pilgrims and personal pursuits. Dinner is roughly the same each night. Local restaurants cater to pilgrims with fix-priced menus including meat, salad, French fries, plus wine and water, for 10 Euro (in 2011). Some albergues have kitchens, and the industrious cook their own meals. Cooking groups form to share expenses and duties. Smokers retreat after dinner. One by one, the stiff and weary bodies retreat to their beds for a little more quiet. Lights go out at 10 p.m., and no one argues about that. Two representations of Santiago. 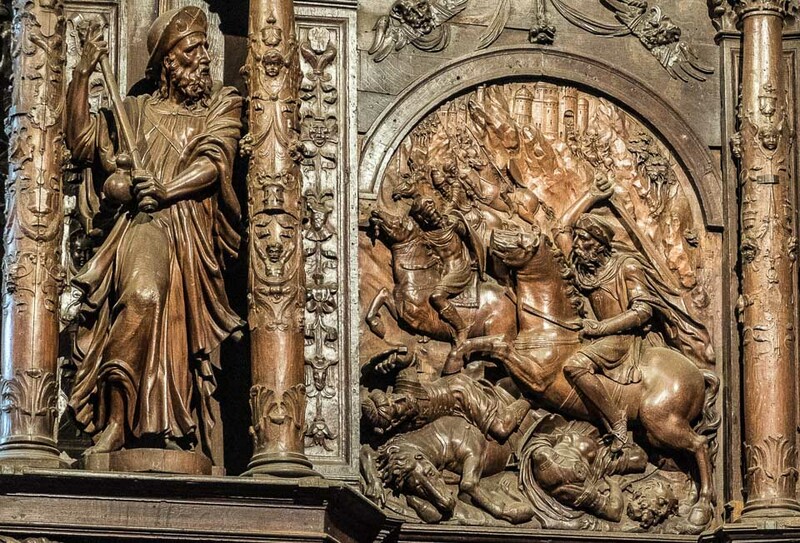 On the left, Santiago Peregrino–Saint James the Pilgrim–and on the right, Santiago Matamoros–Saint James the Moor Slayer–in the Cathedral of Cáceres. After so many interminable days, arriving in Santiago is a jarring conclusion. A lot of pilgrims can’t bear to stop, and continue to Finisterre on the coast, another couple days’ hike. We are finished here, but like most, we reward ourselves with a few extra days in the city of Santiago de Compostela and a nice bed in a private hotel room. We dine with friends, take pictures, and wonder how we’ll carry this experience into our normal lives. The walk is done. We’ve remained in close touch with friends we made along the way. We understand the Camino de Santiago pilgrimage is more than a hike in the woods, and less than the romantic’s walk through an idealized landscape. It is putting one foot in front of the other, and finding a steady calm in the rushing world. You are entirely welcome. Thanks for reading. Santiago de Compostela and the famous walk is on my bucket list for a while now, Kristin! I have read more from your post that I’ve from all other guidebooks about this route. Thanks a bunch for the truly motivating and useful post! Thanks, and I hope you’ll report back when you eventually do the walk. Buen camino. We’re tentatively planning to do the Camino in 2020. Not sure we’ll do the entire thing, though. Some really good, useful information here! I’ve long wanted to walk the Camino ( I did just a tiny bit decades ago) but wonder if it’s possible to sleep in a room full of other people? Or are you so exhausted it doesn’t matter? With earplugs and exhaustion, it wasn’t a big deal sleeping in a dorm setting. I was more worried about having to get up in the middle of the night. But I slept in running shorts and a sports bra and kept my flashlight nearby. No big deal once you start walking! We walked in September and didn’t struggle too much with the heat, though getting an early start was key. We also ran into a snow squall one day, up in the mountains! Mantra: layers. This is beautifully written! I’ve read a bit about the Camino de Santiago but always wondered about the day-to-dayness of it. Besides the fact that I’d have to do some serious training to be able to handle so much walking, I’d be afraid I’d get bored. This article gave me some insight into how the days pass on the Camino. Thank you! This is the best post I’ve ever read on Camino de Santiago; a true guide for an pilgrim making the trek. Thank you! Wow, thanks, Marilyn, that means a lot to me. The Camino brings such a range of sites, people, and emotions, it is difficult to capture. Thx for this comprehensive post about the Camino de Santiago. It truly looks like a life-changing adventure! Thanks, Doreen. The Camino is an experience that definitely stays with us. This article has brought me back to 2011.. You have captured the essence of my 2011 Camino, my first Camino and in fact my Real Camino. Although I have walked so many more since then I regard this one as My Real Camino..And the group of people I met on this Camino are my Real Camino Buddies.. So thank you for this wonderful article , I reminder for me of My Real Camino.. habla pronto mi bonita Amiga.. Eugene..?? It looks like I missed this when you first published. Walking the Camino is a bucket list item of mine not shared by Mr. Excitement (along with the RV road trip fantasy thing). As others have mentioned, in this piece you captured and were able to effectively share the “feel” of the endeavor. Your prose about your Camino whets my desire to have my own Camino story.